The 74AUP2G14 is a high-performance, low-power, low-voltage, Si-gate CMOS device, superior to most advanced CMOS compatible TTL families. This device ensures a very low static and dynamic power consumption across the entire VCC range from 0.8 V to 3.6 V. This device is fully specified for partial power-down applications using IOFF. The IOFF circuitry disables the output, preventing the damaging backflow current through the device when it is powered down. The 74AUP2G14 provides two inverting Buffers with Schmitt Trigger action which accept standard input signals. They are capable of transforming slowly changing input signals into sharply defined, jitter-free output signals. The inputs Switch at different points for positive and negative-going signals. The difference between the positive voltage VT+ and the negative voltage VT- is defined as the input hysteresis voltage VH. This is one package pinout of 74AUP2G14,If you need more pinouts please download 74AUP2G14's pdf datasheet. 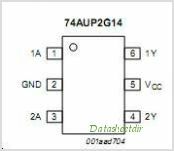 74AUP2G14 circuits will be updated soon..., now you can download the pdf datasheet to check the circuits!